I liked this book. It was lots of fun. but pretty disorganized. It contains a lot of interesting stuff about the Dalai Lama’s childhood in Tibet, his exile to India, his international activities after that. But it’s also somewhat of a random mind dump. If I had to say what the overarching theme of this book was, it would be honoring humanity. 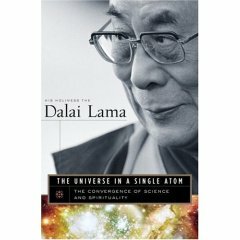 The Dalai Lama uses expressions such as “impoverish the way we see ourselves” with regard to e.g. scientific materialism, which he unfairly conflates with nihilism. He contrasts a view of ourselves as “random biological creatures” with that of “special beings endowed with the dimension of consciousness and moral capacity”, claiming that this decision will “make an impact on how we feel about ourselves”. But…ummmh…we are random biological creatures. I thought Buddhism already accepted that. “How we feel about ourselves” is some grade-school self-esteem issue—do we need to affirm our unrandomness in order to feel good about ourselves? Frankly, this sounds more like the Pope than the Dalai Lama. In the interest of making my posts shorter and more readable, I will stop here, but threaten to analyze the remaining 90% of this book here later. This entry was posted on Thursday, January 6th, 2005 at 07:31	and is filed under reading. You can follow any responses to this entry through the RSS 2.0 feed. You can leave a response, or trackback from your own site. We love the Dalai Lama and appreciate his efforts to awaken the world to a spiritual awareness. Messages on the Holy Inheritance blog would seem to indicate that the only way to really focus on humanity is to focus first on God. We ARE random (biological creatures)? How do you know that? I would respectfully suggest that is just an assumption, and that any biological creature is a combination of both random and non-random processes, with the latter prevailing until the time of death when an organism can no longer to maintain self-organizing order against the forces of entropy. Maybe i’m just stating the obvious, while the writer perhaps intended to convey his belief that humans are not “special beings endowed … with no purpose.” I withhold my judgement on that one. I’m reminded here of the fragment of a lyric from The Kinks’s singer Ray Davies: “if life is for living, what’s living for?” Beat’s me, but it’s certainly an interesting ride. What he meant saying we’re not random creatures doesn’t mean that we’re not random genetically, he was speaking about the laws of the universe, specially one law: the Karma. This law says that every cause has an effect, and every effect has a cause, so we are an effect created by a cause. Genetically this was translated into a mutation but spiritually speaking, our existance has a cause, a purpose, and a meaning. We’re here to evolve, to achieve greatest states of consciousness, and to follow our evolution after “death”, to get rid of Sansara wheel, and become enlighted. These are the aspects of Buddhism that cannot be put toguether with science. I hope this is useful to understand Buddhism better.